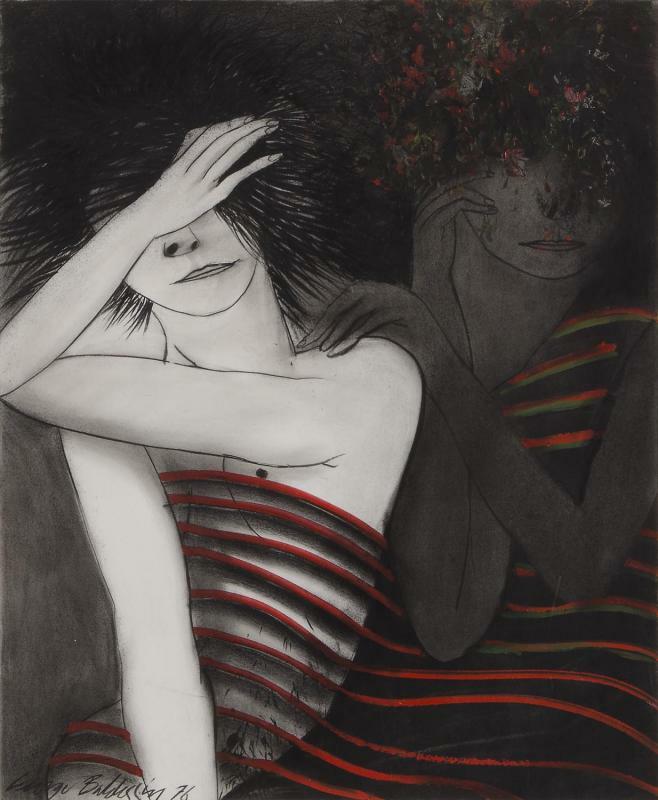 Baldessin achieved critical success early in his career, selling his first work to Joseph Brown at the age of twenty-five.¹ During the late 1960s, Baldessin won a number of art prizes, including a travelling scholarship to Japan. He participated in ‘Ten Printmakers’ at the NGV (1970), alongside prominent artists Fred Williams, Arthur Boyd and Noel Counihan. Along with Imants Tillers, he represented Australia at the 1975 Bienal de Sao Paulo. (Deux Personages) was executed in Paris, where Baldessin lived with his wife Tess, from 1975 to late 1977. In this period he completed two distinctive series of works, including MM of Rue St Denis, inspired by his new surroundings and experiences, and attended the famed Lacouriere print workshop. Baldessin’s success and renown during his lifetime was tied to his mastery of both printmaking and sculpture; the originality of his imagery; his willingness to experiment with materials and techniques and his influence as a role model for younger artists. Baldessin was a master of line and form, particularly of the female body and his skill as a draughtsman is seen in this work with the strong use of contrast and variety of line. The splash of fluid red stripes across the figures bind them together. The hair growing on the torso of the foremost figure, suggests this is a precursor for the Paris MM of Rue St Denis (Mary Magdalene) series2, which he exhibited on his return to Australia in 1977, at Rudy Komon’s Gallery in Sydney. His death at thirty-nine, at the height of his career, came as a shock to the artistic community and it is only recently that Baldessin’s reputation as a significant Australian artist has been reinvigorated with exhibitions of his work at Castlemaine Museum and Art Gallery and TarraWarra Museum of Art (2000) and the touring exhibition Creative Power: The Art of George Baldessin (2013-15).